Contents 2 Photoluminescent Aluminum Snap-On Chevrons. 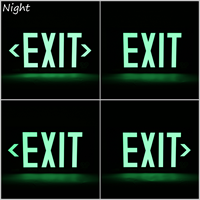 Enlighten your exit path with a Photoluminescent Exit Sign. Distinct red color stands out while illuminating the way to safety. • Sign face absorbs light during the day, so it can shine at night or during an emergency. Photoluminescent material is blended with acrylic, for a longer lifespan. • Sign is made of a thick 60 mil aluminum. A sturdy construction when compared to 40 mil aluminum used by other companies. • Meets UL 924 standards for visibility and mechanical construction. Sign will stay lit for over 90 minutes in a blackout or emergency. 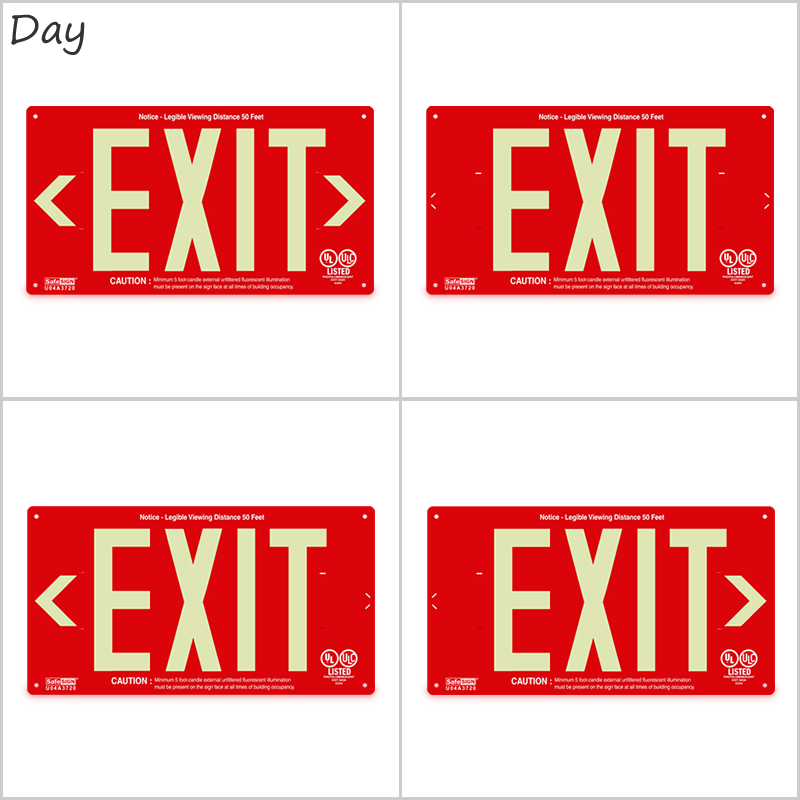 • Sign features 4 mounting holes to permanently secure the sign to a flat surface. Installation is quick and easy with predrilled holes. Many competitors do not include mounting holes which can make installation difficult. • Includes 2 metal snap-on chevrons. 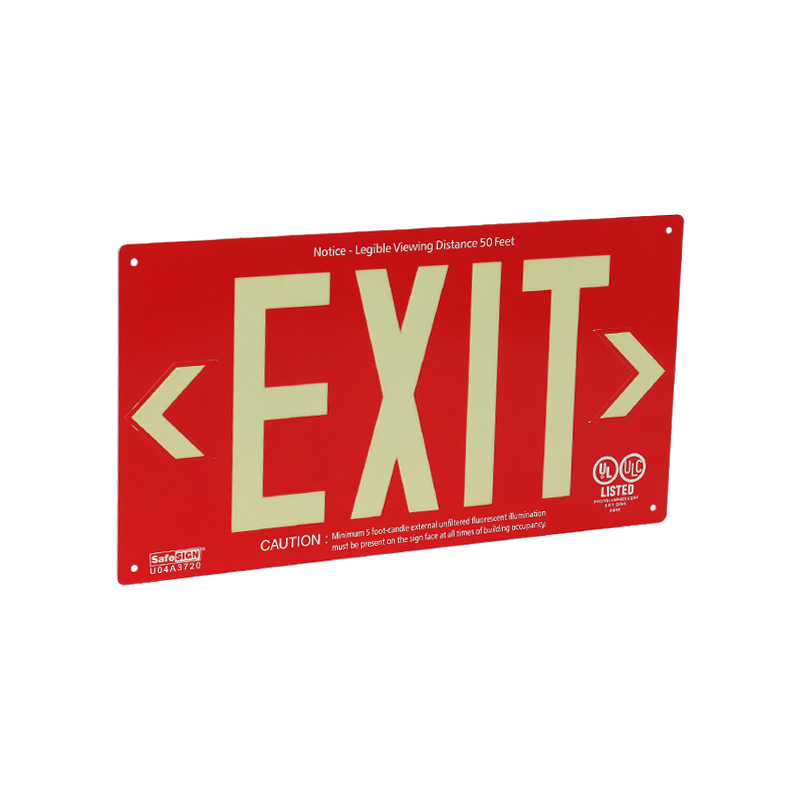 Metal chevrons are superior to adhesive chevrons used on other exit signs. 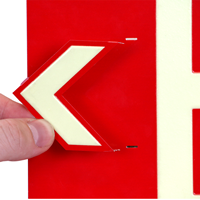 Adhesive chevrons can be easily peeled off, while metal chevrons are secure. Simply snap in the appropriate arrow to direct traffic to the closest exit. • AlumaGlow™ signs are ideal for quick installation - without wiring. Made of heavy-duty, 60 mil thick aluminum. • Meets and exceeds the observation visibility criteria required for UL-924 "Emergency Lighting and Power Equipment" meets NFPA Life Safety Code 101 requirements. These UL924/ULC signs are approved for 50 feet of legible viewing distance. 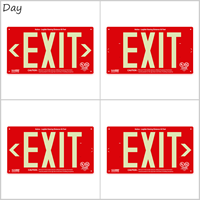 NFPA 101 also requires a distinctive background color for exit signs. Color of the sign has to standout from your room's decor. Red is the most common color chosen because of this. • Non-radioactive, non-toxic and flame retardant. The sign features a uniform legend illumination. Photoluminescent Material is applied directly onto the aluminum body - without the use of plastic or vinyl. 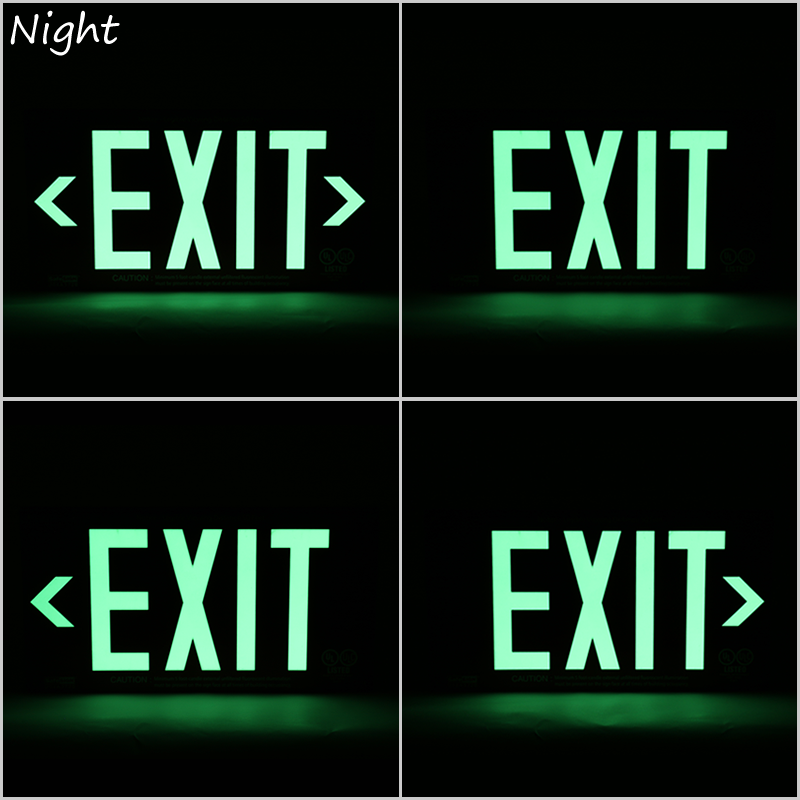 Sign will illuminate in a glow green color when the lights go out. Sign does not need batteries and is explosion-proof. There is no need for future HazMat disposal. • Install in locations with a reliable external illumination source, supplied by a circuit not controlled by automatic timers or sensors, and whose controls are accessible only to authorized personnel. This reliable external illumination source is to be energized at all times during building occupancy. • AlumaGlow™ signs are legible from 50 feet. For a charging light source, 5 foot-candles of light must be present on the sign face at all times during building occupancy. After it is exposed under to this light for 60 minutes, it will be visible and legible in total darkness to observers standing 50 feet away from the sign 90 minutes after all light has been extinguished. • Photoluminescent pigment has a design life expectancy of 20 years+. 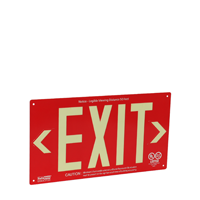 • Mount the AlumaGlow™ exit signs to any flat surface. Signs come with 4 predrilled and cleared mounting holes. • Includes photoluminescent, lock-in chevrons you can install anywhere. Push in tabs fasten to the base plate. right for the job, right price. Just what we were looking for did not have to run wires save $.